Watching Tottenham’s youngsters challenge for the title last season, it wouldn’t have been surprising for Massimo Luongo to feel a sense of regret. After coming through the ranks with Harry Kane and Danny Rose, it was once his dream to play alongside them in the first team. Instead, the young Australia international was sold to Swindon in 2013, before joining QPR last year. This is perhaps the only time Luongo has looked back after leaving Spurs. In his first season at Swindon, which saw the Robins narrowly miss out on the League One play-offs, his promising performances were rewarded with a first international call-up in March 2014. With the World Cup just around the corner, it was perfect timing. Lungo was included in the Socceroos’ 23-man squad for the tournament in Brazil, but watched from the bench as the team were eliminated from a tough group including the Netherlands, Chile and Spain. When his next opportunity to showcase his ability on the international stage arrived, Luongo made up for lost time. In 2015, he was named most valuable player at the Asian Cup after helping Australia win their first title and scoring against South Korea in the final. “Winning the Asian Cup was massive,” he says. “But I didn’t even know there was a player of the tournament award at the end, so that was a little cherry on top. I was already buzzing at the time, and then they called my name out and I was like ‘what’s that for?’ So that was unreal. After returning from the Asian Cup in January 2015 to finish another impressive season at Swindon, helping the club to fourth and being named in the League One team of the year, Luongo was snapped up by QPR. An old Spurs connection played a part – with Chris Ramsey then in charge at Loftus Road – but the manager was soon replaced. Further changes have seen Luongo play under four different coaches in just 18 months, an experience he admits has been challenging. 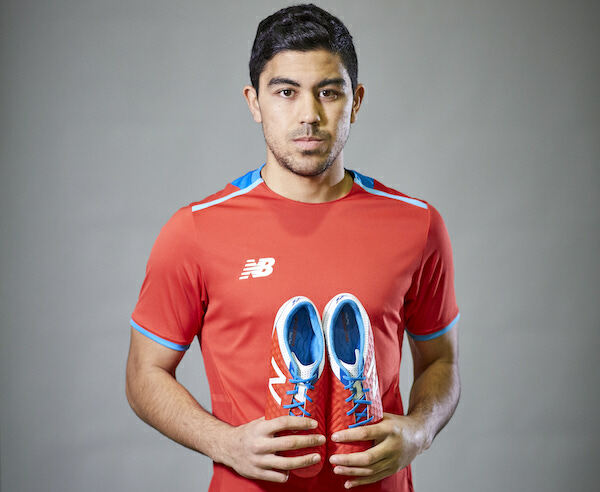 Massimo Luongo wears the new Atomic/Barracuda New Balance Football Visaro boots. To find out more about New Balance Football go to newbalance.com/football or follow @NBFootball on Twitter and Instagram, @nbfootballofficial on Facebook and NB.Football on Snapchat.